His death is being mourned all around the world in a way seldom seen before, a sign of the massive impact he had on several generations. The days to come will be filled with anecdotes, retrospects, documentaries and specials about his life, and most importantly about his music. Rightfully so. Similarly, many people want to play their favourite Prince tracks in honor of a great artists. However, those who know Prince realize that this is more easily said than done. Prince was known for protecting his work. Not just from pirates, but also from greedy music labels and other ‘profiteers.’ This is one of the reasons why it’s hard to find his tracks on YouTube or Spotify. Prince’s piracy aversion was particularly strong. He was one of the first to threaten The Pirate Bay with a lawsuit almost ten years ago, as co-founder Peter Sunde recalled yesterday. With the help of Web Sheriff he also made sure that pirated copies were regularly removed from various pirate sites. At least, from those sites that honour takedown requests. 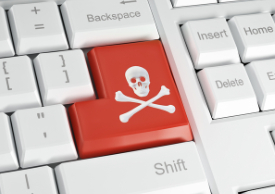 Despite this strong anti-piracy stance, Prince fans have not shied away from torrent sites over the past 24-hours. On the contrary, just several hours after his death full discographies and compilation albums were uploaded all over the Internet. Before his death only a few dozen people were actively sharing Prince albums online, but this number jumped to several thousand soon after his passing. 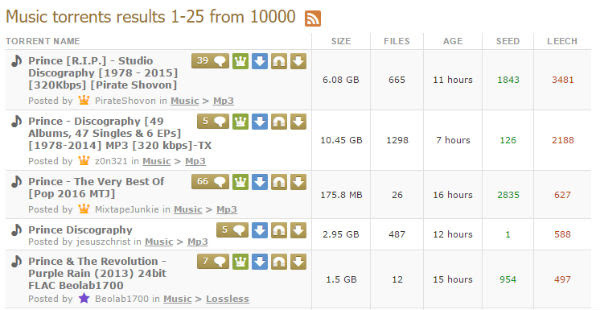 Over the past day an estimated 100,000 people have downloaded a Prince torrent. And on KickassTorrents, the most visited torrent site, Prince currently fills the top five most-shared music file slots. Most users probably see nothing wrong in downloading the tracks. Some might even do it as some sort of tribute, as the various comment sections are littered with RIPs and positive words. However, the piracy craze feels a little awkward to say the least. Perhaps the best way to honoUr Prince is to buy some of his music. Not because the money will do him any good, but because that’s what he would have wanted.